Race to the Top - OutSell Consulting, Inc. Reaching the Top is Not the only way to achieve Success! 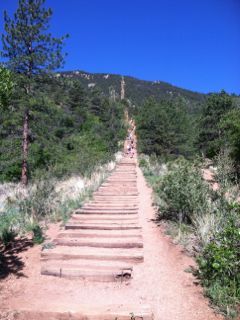 Sunday morning, after reading the above quote, I set out to climb the Manitou Incline, a roughly 2,000 vertical foot ascent in 1 mile. It would be my mothers first attempt, with my much younger and very athletic brother joining us. I was very tempted to race my brother to the top as there are verifiable bragging rights associated with ascending the incline quickly, and god forbid my baby brother beat me! An approximate 2,000 foot elevation gain in 1 mile, hiking at it’s best. We stood at the bottom looking up and I was reminded that this was no easy feat and as my mom’s first attempt she was going to struggle. My brother took off at a steady pace and it was not long before he was out of sight. Feelings of competitive failure began to stir deep within me! Then I heard my mom begin to breath hard. I turned around and saw her start to slow down and look up at the incline with an expression of absolute horror. I slowed down even more to stand beside her as I reflected on my first attempt and told my mom that it was OK to stop, that she should take her time, drink lots of water, and we would do this together. She insisted that I could go ahead. Despite how badly I wanted to do just that it occurred to me that I had already made this climb, already hit that mark, had no question that I could ascend fairly quickly, I’d already raced to the top. The real challenge was in helping my mom get to the top on her first attempt without bailing out half way. We were less than a quarter into the hike. Mom struggled, she got lightheaded and physically wobbled on the trail, not a good thing on a trail this steep, and we stopped together many times. Others passed us and many bailed out where they safely could. Some folks verged on tears, and I wondered how quickly the EMT’s could arrive. Slowly and surely mom made the climb as I followed behind encouraging her and helping her place her hands and feet. About two thirds of the way to the top my baby brother came whizzing back down, barely sweating! Another hiker and I threatened to give him a helpful push off the mountain! Yet he turned around and together the three of us made the final climb, my mom bent over, practically crawling, pulling herself to the top with her hands. We celebrated together as my mom looked down on her amazing accomplishment. Standing at 8,500 feet above sea level, after hiking/climbing 2,744 railroad ties in about a mile! Mom skipped down the descent bouncing off of boulders with excitement. She was so filled with joy that she could not help herself. She later told my dad that there is no question she would have quit if I had climbed ahead with my brother. The happiness I felt reminded me of my first Pikes Peak summit a number of weeks prior that had left me with such a void. My friends and I set out to summit Pikes Peak, one of Colorado’s more famous 14ers, to celebrate a 70th birthday. Deana’s dad, Jack, had attempted to summit Pikes Peak 5 years prior and failed due to the extreme altitude. The summit of Pikes Peak stands at 14,110 feet above sea level. Although the climb itself was not overly difficult for me, I had not dressed appropriately for the weather conditions. As we gained elevation the group’s pace began to slow and I felt increasingly cold and uncomfortable. Rather than stick with the group I scampered to the top about an hour ahead of them, partly to alleviate my discomfort, and partly because I was increasingly impatient in my race to the top. I had just completed my 6th 14er! While this should have filled me with joy and satisfaction I have not been able to shake a horrible emptiness associated with that climb. You see, the rest of the group summited WITH Jack, they physically helped him ascend the technical boulder field when he was having difficulty breathing, and they celebrated with him at the top before rushing him to the EMT! At no point was I anywhere close to needing an EMT, yet I flew ahead of the group. I could not help but to reflect on that climb as I went through my Sunday morning routine and prepared to tackle the Incline. You see I chose a selfish path in summiting Pikes Peak. I failed to realize that the real challenge lie in helping someone else achieve a life long goal. As a leader, I needed to enable, not just perform. As typically happens in life, we are often presented with opportunities to learn from our mistakes and right our wrongs. As leaders, directors, managers, and coaches there is no question that we are capable of completing a task ourselves and completing that task at a much higher level, after all that is why we are where we are. Due to our ability we each can feel impatient at the pace of our colleagues and teammates. However, in our race to get to the top, there is no challenge in getting there first, especially when that means leaving our team behind! The true challenge, or rather responsibility, lies in enabling others to achieve those same goals at the same level for their first time. There is nothing we can do to change the past and I will never regain the opportunity to truly be a part of summiting Pikes Peak for Jack’s 70th birthday. I will, however, have many opportunities to help others achieve similar success by coaching forward to what can be affected in the next attempt, by building skills through demonstration and delivering positive encouragement while celebrating every little step and success of those surrounding me who have not yet ascended their tallest mountain. I can lead by following. So, what will you do today, when you sit with your team, to help each of them achieve their desired goals and be better than they were yesterday?